When most people think of a vacation in Canada, they usually think of getaways to places like the Canadian Rockies in Alberta or Vancouver or Montreal. Very few people immediately think of Manitoba when considering a trip across the border and fewer still would think of Churchill; but that's a mistake. Churchill, Manitoba, is a tiny town located on the Hudson Bay in the northern part of the Canadian province of Manitoba. And when I say tiny, I mean tiny. The population of Churchill is less than 1,000 intrepid souls. So why, then, am I telling you to put this sub-Arctic town on your bucket list? Well, I'll give you three very good reasons. Churchill is known as both The Polar Bear Capital of the World and The Beluga Capital of the World. From the months of July to November each year, this tiny town affords some of the most unique wildlife encounters in Canada. In the summer (July-August), the Churchill River becomes a prime congregation spot for pods of playful and curious beluga whales. Thousands of these gentle giants can be spotted in the waters around Churchill during this time, and visitors can interact with them via Zodiak boat tours, kayaking and even snorkeling/swimming. And then the polar bears arrive in the fall. For 6-8 weeks every autumn (October-November), Churchill becomes one of the only human settlements in the world from which people can observe polar bears in the wild. This is when the bears make their way from where they spend the summer in far northern Canada back to the newly formed sea ice on Hudson Bay. There have been years when, during these weeks, the polar bear population has surpassed the human population in Churchill. Without a doubt, if you love wildlife then Churchill is the place for you. Along with being the Polar Bear Capital of the World, Churchill is also consistently listed as one of the best places on earth to view the aurora borealis, or Northern Lights. Churchill is positioned perfectly beneath the auroral oval just south of the Arctic Circle, where the dancing green lights are most active and able to be seen. 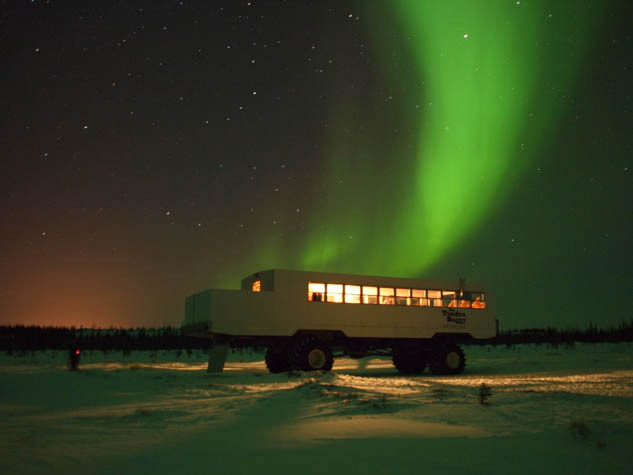 Thanks to cold, crisp and long nights combined with very little light pollution in the surrounding tundra landscape, Churchill has some prime viewing conditions especially during the winter months. Going to Churchill in the off-season guarantees you a very good chance (75% or better) of seeing the Lights, although of course nothing can be guaranteed. Churchill is located right on the edge of an interesting biome known as the tundra. This means low temperatures, few trees and a short growing season. And it also means that there are some really interesting outdoor adventures to be had. A summer visit to Churchill might mean bird watching, kayaking and trying to spot tundra-dwellers like the Arctic fox. Visiting in the winter, meanwhile, gives you the opportunity to go dogsledding or snowshoeing in order to get a feel for life in the far north. Churchill is by no means a destination for those looking for big cities or fancy hotels. It's a rustic, rugged and sometimes harsh place. But it's also incredibly rewarding and one of the best places in Canada to go if nature calls to you. Is Churchill somewhere YOU would like to visit? Join the conversation and please be sure to follow us on Twitter! Graduate student by day and avid traveler and blogger by night (and on weekends and during holidays), Amanda is just a small-town Ohio girl trying to balance a "normal" life with a desire to discover the world beyond her Midwest bubble. Amanda's adventurous nature and inability to say "no" have led her to some pretty amazing adventures all around the world. But she has no desire to stop exploring anytime soon. Read Amanda's blog, A Dangerous Business, or follow her on Facebook, Twitter or Google Plus.